I’d tried this wine a while ago, and whilst it was good, I thought it might be better having had some time to grow up, so I left it alone for a while, and then I forgot about it for a good while longer. 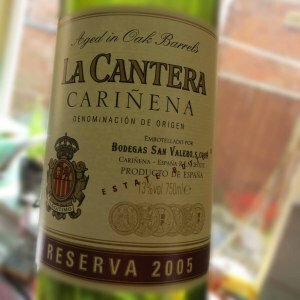 This La Cantera Carinena 2005 Reserva from Laithwaites had therefore had rather longer lounging about with nothing to do than I intended. I was a bit concerned that it may have got a bit lazy in there. I opened the bottle about an hour before drinking to let it have a little air, and poured it through my aerating gizmo to give it the best shot at being good. It looked healthy, with a deep red colour, with little signs of bricking just starting to appear around garnet edges. It had good strong legs. It smelled a fruity still, with jammy fruit, topped with a little acidity, almost in an Italian wine style. There was something blackberry and Morello cherry-ish in the aromas as well as plenty of vanilla which added a bit of sweetness. So far so good, I was ready to taste it. The wine was dry, with a medium high level of acidity. That acidity wasn’t unpleasant though, it was almost balsamic. The tannins were ripe, with more than a little being added from the oak, making them slightly woody. The balance between fruit and oak was possibly tipped a little too far into the oak sector, with toasty vanilla overwhelming the cooked berries a little bit, like a crumble that has too much topping and not enough fruit. The alcohol level was medium and the overall package added up to being a medium bodied wine. I enjoyed it, and I do think the long dark days nestling quietly under other bottles had done it some good, although I don’t think I’d leave it much longer. I looked back at pricing, and it came in at £8, although that was the retail rate and the mixed case it came in came with a 20% discount. At that price I thought it was a reasonable deal.